KAESER Rotary Screw Air Compressor supply production processes in industry, trade and workshop applications with a reliable supply of quality compressed air. They are the preferred choice for users requiring constant pressure over a prolonged period of time. We developed our own special rotor profile to ensure that our rotary screw compressors operate as efficiently as possible. Our SIGMA profile rotors provide you with energy savings of up to 15 % compared with conventional rotor profile. Our air ends with SIGMA profile rotors boast an exceptionally long service life. This is in no small part due to the roller bearings we choose to use: they are precision adjusted and generously sized. Combine this with our in-house high-end manufacturing processes with lowest possible manufacturing tolerances. KAESAR Rotary Screw Air Compressor provides manufacturing process in the industry, trade and workshop implementation along with a genuine supply of standardized compressed air. It is the ultimate choice for the customers and users who are in need of constant pressure for the longer duration of time. The rotor profile has been developed by highly efficient professionals to ensure the effective and efficient operation of the compressor. The SIGMA profile rotor is equipped with an energy saving module which saves the energy up to 15% as compared with the ordinary rotor profile. It is equipped with a rotary screw compressor with fluid cooling along with low noise compressor and Helium rotary screw air compressor. The KAESER Air Compressor is equipped with a rotary air compressor with a v-belt drive and rotary air compressor with a direct drive. The different kinds of compressor packages in the air compressor include- complete compressed air system, compressor package with air tower and compressor package with air center. The different types of compressors serve different utility like energy efficient screw compressor, SIGMA profile rotary compressor, Kaeser sigma frequency control compressor, petroleum packages compressor, and marine packages compressor. The compressor is equipped with dual HSD series compressors to enclose in a single unit and hence require minimal space with outstanding output capacity. The system is designed in such a way to cater to the demands, reducing idle time and increasing efficiency. The two compressors can perform absolutely independent. If in case there’s an incidence of unit failure then still you have half (50%) of the flow rate. The use of IE4 motors in HSD models provides greater energy savings and extraordinary efficiency. The HSD systems can be ordered with or without speed-controlled drive depending on the need. Because of the high flow rate they are best suited for demand aided applications either in the automotive sector or in the steel industry. The KAESER Air Compressor has a flow rate of 0.26-0.6 m3 per minute and the nominal motor output of 3 kilowatts along with a sound pressure level of 69db and discharges pressure of 7.5-13 bars. Because of such incredible and high end features the KAESER Air Compressor becomes the ultimate choice for the consumers. The KAESAR Screw Air Compressor provides manufacturing process in the industry, trade and workshop implementation along with a genuine supply of standardized compressed air. It is an ultimate choice for the customers and users who are in need of constant pressure for the longer duration of time. The rotor profile has been developed by highly efficient professionals to ensure the effective and efficient operation of the compressor. The system is designed in such a way to cater the demands, reducing idle time and increasing efficiency. 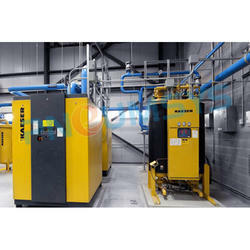 The KAESER Air Compressor has a flow rate of 0.26-0.6 m3 per minute and the nominal motor output of 3-kilowatt along with a sound pressure level of 69db and discharges pressure of 7.5-13 bars. 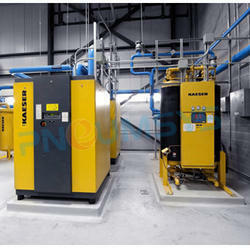 Because of such incredible and high end features the KAESER Air Compressor becomes an ultimate choice for the consumers. We are supplying all-in-one compact Compressed Air Package for production processes in industry, trade and workshop applications. Compressed air systems of the SXC series have been designed for trades and crafts. On only 0.62 m², they comprise all components necessary for air supply under a single strong polyethylene cover: a rotary screw compressor with SIGMA-Profile, a refrigeration dryer, and an air receiver. Piping and installation of our integrated packages take little time. Simply connect this compact compressed air package to the power supply and compressed air distribution network and you’re ready to go - that’s it! Thanks to the integrated refrigeration dryer, the SXC package delivers high air quality and protects your tools and equipment from corrosion damage. All maintenance and service points are easily accessible once the SXC’s removable enclosure which is made of rotationally molded polyethylene is effortlessly lifted away. The electronic condensate drain can be inspected via a grille. Maintenance is simple and effective. KAESER Rotary screw air compressor with 1:1 direct drive comes with the feature which help plant to Save Energy Efficiently. Now it is easy to meet virtually any compressed air demand with fluid-injected KAESER Rotary screw air compressor 1:1 direct drive. 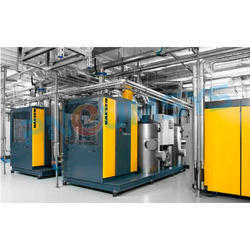 We offer a huge selection of compressors ranging from 18.5 kW right up to 315 kW. The motor drives the air end directly without transmission loss via a maintenance-free coupling. All models are equipped with energy-saving 1:1 direct drive. The use of IE3 motors has been mandatory in the EU since January 2015. Furthermore, we already use IE4 motors in our BSD – FSD models with 1:1 drive to provide you with even further energy savings. Electronic thermal management dynamically controls the fluid temperature of ASD, BSD, CSD, CSDX, DSD, DSDX, ESD and FSD series compressors. This not only saves additional energy but also reliably prevents condensate formation and associated moisture damage. 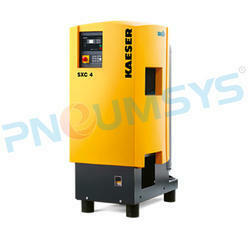 Kaeser Rotary screw air compressor specializes for its Compact design with impressive performance. 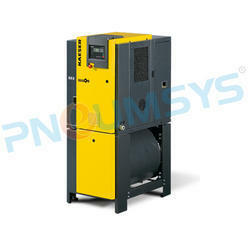 Kaeser rotary screw compressors with V-belt drive provide outstanding efficiency and reliability. They feature the energy-saving SIGMA profile rotor and a SIGMA CONTROL 2 (or, optionally, SIGMA CONTROL BASIC)controller. The complete solution for vacuum generation.KAESER Rotary Screw Air Compressor with Vacuum Pump is equipped with a specially-developed KAESER vacuum air end with SIGMA profile. Single-stage vacuum generation supplies a so-called low vacuum. Cooling air filter mats protect the interior from dirt, the gas ballast provides enhanced water vapor tolerance, low speeds extend the service life of all components. KAESER HSD series Fluid-injected Rotary screw air compressor with dual compressors integrated two compressors in a single enclosure. Both units are fully equipped with 1:1 direct drive, SIGMA CONTROL controller and cooling system. Two small compressors in a single enclosure save much space when compared to a single compressor unit with corresponding output capacity. This system optimally adapts to different demand situations, minimizing idle times and increasing efficiency. Each compressor unit can be operated completely independently. In the event of a unit failure, you still have 50 % of your flow rate. Furthermore, we already use IE4 motors in HSD models and therefore provide you with even further energy savings. You can order HSD systems with or without the speed-controlled drive. Due to the High flow rates, they are very well suited for demand-intensive applications in the automotive sector or steel industry.